This isn't your first close-up of another planet's biosphere... it's actually the Maldives islands on Earth, as viewed from the International Space Station. A couple of ISS astronauts have been twittering amazing pictures of our planet. Want to see more pics like these? Follow astro_jose and astro_soichi on Twitter. The Earth and moon, from astro_jose. 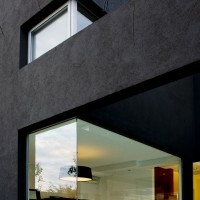 Andrés Remy Architects designed The Black House in a suburb of Buenos Aires, Argentina. 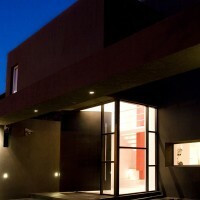 The black house was born by the request of a young couple, brought to us by another of our projects “The Waterfall House”, which gave us the challenge of improving what we had done at that moment, taking advantage of the freedom they gave us during the design. 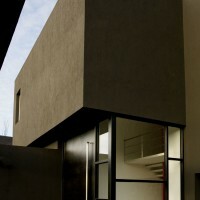 This single house is located in a closed neighborhood, 30km. away from Buenos Aires. The lot, 20 meters wide and 50 meters length with 3 meter of lateral retreats, has amazing views to the lake we could not let aside. The analysis of the lot showed us the advantages and disadvantages we should take into account along the entire design process. The best views to the lake were at the back of the lot, while the best orientation was at the front. The surrounding houses and the wide lot marked the visuals we should use. The simple program, for a socially active couple without children, made relevant the resolution of the social areas. We decided to divide the social areas in two. 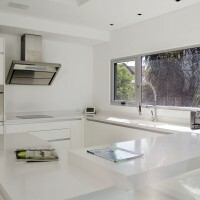 In one side are located the common areas, such as the kitchen and the dinning room. 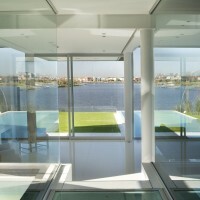 On the other side is located the living room, closer to the lake. The shallow pool that divides the house in two allows the indirect light to bathe the interiors, as the northern sun reflects it’s light on the water surface. This way, light is present in every corner of the house, but never in a direct way. Both programs are connected by a glass bridge, with the water running under your feet. 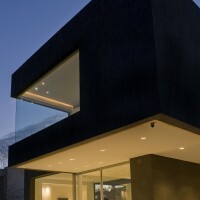 The living room, 10 meters wide and 5 meters length, opens to the exterior using glass walls. 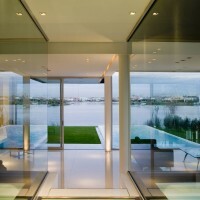 It was thought in a lower level than the rest of the house, making it permeable and allowing the ambients a clean view to the lake. 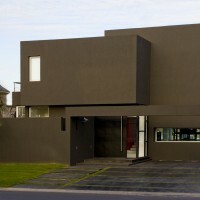 The Black House has an almost provocative sobriety, where the pure white in the inside provoques an emotive contrast with the absolute black in the outside, reminding the bite of an apple. A strong characteristic that names the house. 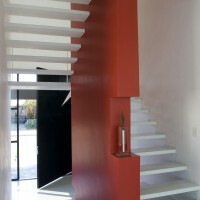 DESIGN TEAM: ANDRES REMY, HERNAN PARDILLOS, JULIETA RAFEL, CARLOS ARELLANO, GISELA COLOMBO. 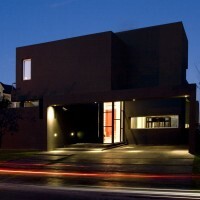 BUILDING DIRECTION: ANDRES REMY, ASOCIATED HERNAN PARDILLOS.